Habit: Shrub, tree, generally evergreen; monoecious or dioecious. Leaf: simple, cauline, alternate or opposite (either +- 4-ranked) or whorled in 3s (6-ranked), linear or scale-, awl- or needle-like (sometimes linear and awl-like on 1 pl, or on juvenile or injured plants), generally decurrent, covering young stems. Pollen Cone: axillary or terminal. Seed Cone: +- fleshy to generally woody, generally hard at maturity; scales opposite or whorled, peltate or not. Seed: 1--many per scale, angled or lateral winged, generally wind-dispersed. Chromosomes: n=11. Genera In Family: 30 genera, 130+ species: +- worldwide, especially North America, Eurasia. Note: Incl (paraphyletic) Taxodiaceae. Taxa of (polyphyletic) Cupressus in TJM (1993) now in Callitropsis, Chamaecyparis, Hesperocyparis. Habit: Shrub, tree; generally dioecious. Stem: bark thin, peeling in strips; young shoots 4-angled to cylindric. Leaf: opposite (4-ranked) or whorled in 3s (6-ranked), scale-like to less often awl- or needle-like. Pollen Cone: generally terminal; pollen sacs 2--6 per scale. Seed Cone: generally terminal, 5--18 mm, +- spheric, +- fleshy, berry-like, glaucous or not, dry or resinous, generally maturing 2nd year, surrounded at base by minute scale-like bracts; scales 3--8, fused, opposite or whorled in 3s. Seed: 1--3 per cone, +- flat, unwinged, often not angled, generally animal-dispersed over 2 years; cotyledons 2--6. Habit: Shrub, tree 1--4(10) m; generally dioecious. Stem: trunks several at base; bark gray, thin, outer layers persistent. Leaf: generally whorled in 3s, 6-ranked; scale-like, closely appressed; gland obvious. Pollen Cone: 2--3 mm, oblong. Seed Cone: 7--12 mm, spheric to ovoid, +- blue maturing red-brown, dry. Seed: 5--7 mm, pointed, angled, brown. Ecology: Dry slopes, flats, pinyon/juniper woodland; Elevation: 50--1500 m. Bioregional Distribution: NCoRI, SNF, ScV (Sutter Buttes), SnFrB, SCoR, TR, PR, D; Distribution Outside California: southern Nevada, northwestern Arizona, Baja California (Cedros, Guadalupe islands). 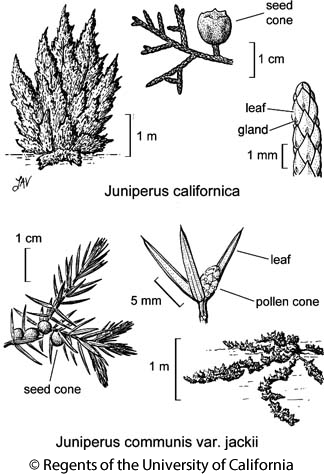 Citation for this treatment: Robert P. Adams & Jim A. Bartel 2012, Juniperus californica, in Jepson Flora Project (eds.) Jepson eFlora, http://ucjeps.berkeley.edu/eflora/eflora_display.php?tid=29749, accessed on April 24, 2019. NCoRI, SNF, ScV (Sutter Buttes), SnFrB, SCoR, TR, PR, D; Markers link to CCH specimen records. Yellow markers indicate records that may provide evidence for eFlora range revision or may have georeferencing or identification issues. Purple markers indicate specimens collected from a garden, greenhouse, or other non-wild location.